Never jack up a vehicle without blocking the wheels to keep it from rolling. Use bricks, wooden wedges, or metal wheel chocks to block the wheels at the end of the car that isn’t being raised. If you’re changing a tire and you have nothing to block the wheels with, park near the curb with the wheels turned in. This may not keep you from getting hurt if the car rolls off the jack, but at least innocent motorists and pedestrians won’t have to deal with a runaway driverless vehicle! Place the jack under the part of the vehicle that it should contact when raised. If you’re using jack stands, place them near the jack. If you place your jack incorrectly, you can injure your car. To find the proper place to position the jack for your particular vehicle, check your owner’s manual. If you don’t have a manual, ask the service department at your dealership to show you the proper placement. If you have a scissor jack, insert the rod or wrench over the knob, and then crank. If you have a hydraulic jack, place the handle into the appropriate location and pump up and down. Use nice, even strokes, taking the jack handle from its lowest point to its highest point on each stroke to cut down on the labor involved. Place the jack stands under the vehicle, near where the jack is touching it. Raise the stands until they’re high enough to just fit under, and lock them in place. Lower the jack until the vehicle is resting on the jack stands. Jack stands hold your vehicle up safely. Substituting boxes, stones, or bricks for jack stands is very dangerous. They can slip out or break while you’re under the car. 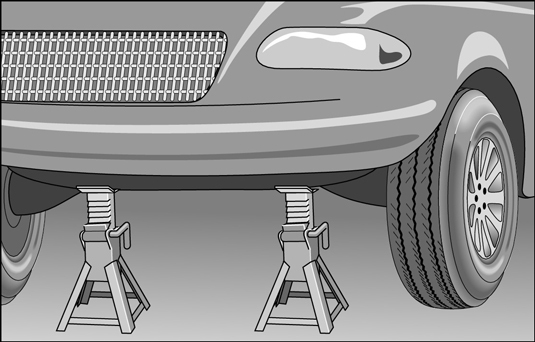 A jack can do the same thing, so be sure to buy a pair of jack stands and stow them in the trunk. Wiggle the vehicle a little to make sure that it’s resting securely on the jack stands. Then remove the jack. When you’re finished, replace the jack, remove the stands, and lower the vehicle to the ground. If you’re using a scissor jack, simply turn the crank in the opposite direction. If you’re using a hydraulic jack, use the rod to turn the pressure release valve. The jack will do the rest of the work for you.